Far Yeast Yuzu Hazy IPA is a 6% NE IPA from Far Yeast Brewing Company, based in Yamanashi, Japan. It’s part of their collaborative range with Gwei-Lo, a Chinese based craft beer brewery, and is also their first foray into cans. Far Yeast Yuzu Hazy IPA is brewed using Amarillo, Citra, and Denali hops, along with locally grown yuzu, aka Japanese citron. Far Yeast Yuzu Hazy IPA poured a little bit hazy golden yellow colour with a mediocre amount of white head on top. That head didn’t last long – it was just long enough to take a picture before going to a few bubbles around the outside. Unsurprisginly, Far Yeast Yuzu Hazy IPA smelt like a yuzu beer – the citrus aroma coming through with a slight grapefruit edge to it. 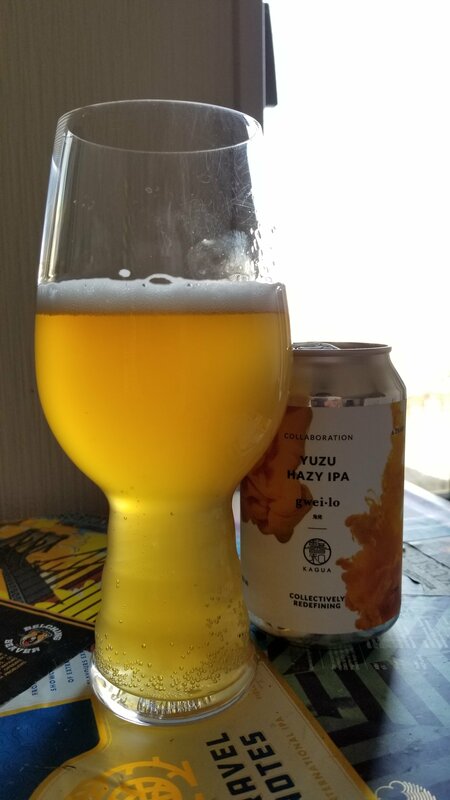 I was honestly expecting something bigger and bolder from this beer – if you’re going to put hazy and yuzu in a beer then make sure you do include both of those. However, it’s in the body where Far Yeast Yuzu Hazy IPA excels. The yuzu brings a citrus twang to the beer with a slight astringent kick to it that offsets the grapefruit and lemon from the hops. Yuzu and lemon, though closely related, are distinguishable in this beer and that shocked me. Is this yuzu? Is this lemon? Wow. It’s both. Far Yeast Yuzu Hazy IPA finishes off with the astringent bitterness leaving its mark on the palate. Far Yeast Yuzu Hazy IPA isn’t quite hazy enough for my liking, but it makes up for it in flavours.